I used this method to order a 16GB Black Nexus 5. The phones went on sale at 6.00pm on Thursday, and my order was in just 15 minutes later, but I didn’t get an email to say it was dispatched until 7.20pm the next day. The tracking reference for Parcelforce shows the phone currently sitting in a depot somewhere in England. Delivery address is the Parcel Motel. Billing address is the address registered to your credit/debit card. According to comments on boards.ie, some people have had success using their Irish credit card – when entering the billing address, use the normal Irish address registered to the card, but add a valid UK postal code on the end (the Parcel Motel one will do), and “UK” as the country. If Google don’t like the order then they will reject it, normally within 24 hours – but there’s nothing to stop you re-submitting an order using different details. Looking to order one of these soon. It’s unlocked network-wise, is it? I can just stick in my card and play? Will you share annoyances, niggles or tips with us after you’ve got it? Is the Nexus 4 you had still working? @Emma: Yes, it’s not locked to any network. You can put any Irish SIM into it and it’ll work. You may need to manually enter APN settings, but these can be easily looked up online. My Nexus 5 spent the weekend languishing in a Parcelforce depot, but according to the online tracking seems to be on the move again, so it should arrive today/tomorrow. I’ve only had my Nexus 4 since the summer and it still works perfectly. Does anyone know *why* Google don’t offer the phone for sale here? I don’t have any way to get a UK registered Credit Card and they rejected the order when they saw my billing address was in Ireland. The mind boggles that we have to resort to the method here or look for one to pop up on eBay. An important note for anyone considering buying the Nexus 5 from America. There are two versions of the Nexus 5 on sale – a North American version (model D820) and a rest-of-world version (model D821). The reason for this is that the US and Canada use different LTE (4G) bands than the rest of the world. In Ireland the networks here are licensed to use LTE bands 3 (1800MHz), 9 (900MHz), and 20 (800MHz) – all of which are supported in the rest-of-world version of the handset – but none of them is supported in the US Nexus 5. Therefore 4G on the North American model will not work in Ireland. However the 3G and GSM services would work correctly. I have been trying to follow your thread re trying to procure Nexus 5 from one of my relatives in US. Can you confirm if I can safely ask my relative to send it to me from US with the phone working correctly with Vodafone Ireland? I have doubts re using 3G data connections other features … Can I safely get one from US and carry basic day to day functions? Also, the phonesonline.ie link that you have, I assume if I buy, it will be the D821 model i.e. rest of the world model and it will surely work on any network providers for European standards. @Venky: If your relatives post the phone from the US, you might end up being liable to pay Customs Duty and VAT on the package when it arrives in Ireland, which can add significantly to the cost. As far as the phone itself, the 3G data and calls/texts should work fine with the US version on any of the Irish networks. It’s the 4G that won’t work over here. With phonesonline.ie I would be very surprised if it wasn’t the rest-of-world model that they’re selling, but you’d need to clarify that with them directly if you’re worried. I was thinking of driving up to the north, to Carphone Warehouse and buying it there, then bringing it back to Rep of Ireland. Would this work also? Hi Terence. The only listings I can see for the Nexus 5 on the UK Carphone Warehouse website seem to be tied to 2-year contracts. Are they also selling the handset SIM-free? As long as the handset isn’t locked to a particular network then it should work perfectly in the Republic. Yes I just seen that there, apparently they only had a limited number of sim free available and they sold out, so I did see it at one stage but no longer unfortunately. So its looking like phonesonline for me with its markup price. Thanks for posting. Very handy way of ordering. How are you finding the new nexus? How does it rate against the likes of the S4 and Z1. And what sim deal did you opt for? Thanks Richard. Very useful information. How much did Parcel Motel set you back for delivery onto your residential address in Ireland? Parcel Motel deliver to self-service lockers at locations all over Ireland, and have a fixed €3.50 fee per use regardless of location. So you collect the Nexus 5 at a locker in Dublin instead of it being forwarded onto your address via An Post? Yes, when you sign up to Parcel Motel you select the location where you want any items delivered – see locations: http://www.parcelmotel.com/locations.html – although if none of them locations suit, you can pay an extra €10.50 on top of the standard €3.50 usage fee, and the folks at Parcel Motel will deliver to any address in Ireland (Republic or NI). See their web site for full details. The issue is that with the Nexus 5 you need to have an address in UK, so sending to NI Parcel Motel base qualifies as that. Parcel Motel is run by Nightline courier company. For other items, many suppliers will ship to UK free of charge but charge £7.50-£10 (and I’ve seen more) to ship to Ireland. If you get them to send to your local Parcel Motel station, you only pay €3.50. Much more palatable and I’ve taken advantage of it many times. The first two times you use the service was free when I signed up. Not sure if that is still the case. I’m looking at buying a Nexus 5 which is US Version- can you confirm the only problem with it would be that it does not support 4G in Ireland? Hi Will – from looking at the Nexus 5 specifications, the only difference I see between the two versions is in the LTE (4G) bands. Excellent – looking at buying it this evening – will report back on how I get on. Got the phone and works perfect- would highly recommend. Have been a staunch iPhone user for the last few years but this has been a great choice! Good news Will. I’ve had mine for about 5 or 6 weeks and I love it! I found the easiest way was to order from http://www.clove.co.uk – they ship to Ireland next day and no messing about with p.o. boxes. Also £100 more expensive than ordering direct from Google! What english mobile phone number did you use because it’s not allowing me to us my Irish one. I think Google must have added that you must have a valid UK phone number to the checkout procedure. Were you asked for a UK mobile / landline at the time of ordering? I don’t remember having to supply a UK mobile number – so, as you say, this must be new. I guess they want a number to call if there’s a query with the order. 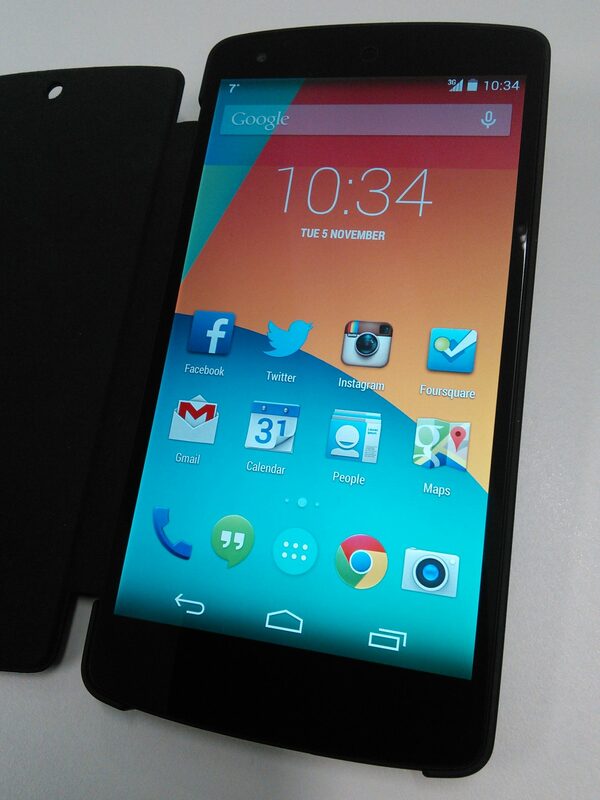 The Nexus 5 is available from 3 in Ireland from Monday! €439 prepay or free on billpay (€40.66/month for 24 months). Looks like a good phone for the price! Google have finally expanded sales of the Nexus 5 and Nexus 7 across Europe, listing them on the Play Store in eight new markets. These include Austria, Belgium, Denmark, Finland, Ireland, the Netherlands, Portugal and Sweden, giving customers the option to bypass operators and buy a SIM-free unlocked Nexus direct from Google. I got a friend to get me a N5 from the states and send it over. Because it’s an american model is it pretty unlikely i’ll be able to use 4G in Ireland? Yes, unfortunately the 4G frequency bands used in the US are different from the rest of the world, and so there are two models of the Nexus 5 – one for US and one for the rest of the world. However the 3G and GPRS/EDGE data in Ireland should work just fine with the US model. How about ordering a N5 from Amazon UK on UK contract, get it delivered via parcel motel to Ireland. I should be able to unlock it upon receiving it.